The amazing over-water spa. The 90-minute signature massage is a must! 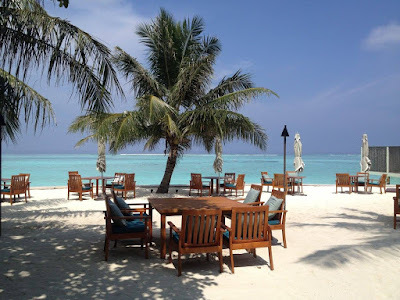 OK, admittedly the first time I ever went to Four Seasons Landaa Giraavaru (in 2012) I was accompanied by a rather dashing Swiss scuba-diving instructor/photographer (which may have affected my perception of the place) HOWEVER I've been back many time since and L.G. can still do no wrong in my eyes. Landaa Giraavau may be further away (30 minutes by seaplane if they fly directly there and don't stop at other resorts on the way) but the benefit of being further from the international airport is that it feels less congested (few planes flying overhead, fewer boats passing by etc). David took this pic of me admiring the water (back when I was experimenting with dark brown hair!). Barely another island or boat in sight! Another reason why I love Baa Atoll. 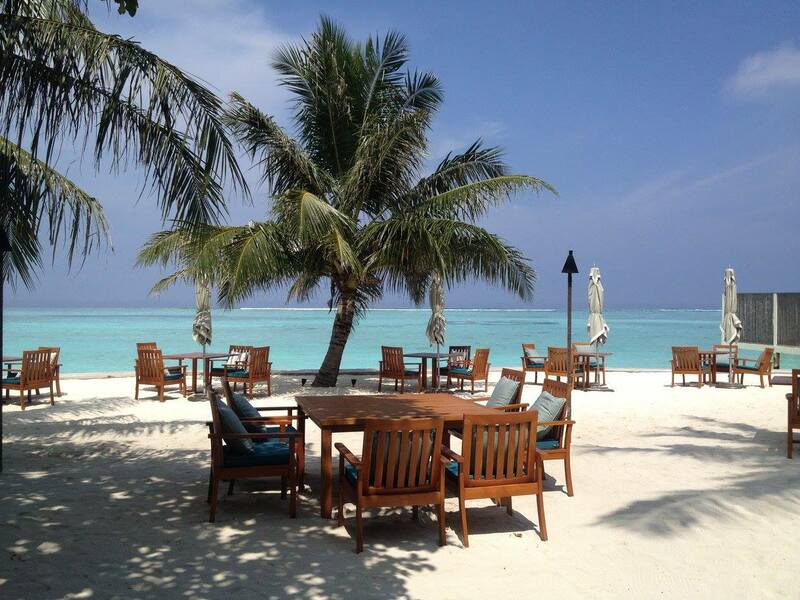 So let's dive in: Four Seasons Maldives at Landaa Giraavaru is located in Baa Atoll, a UNESCO World Biosphere Reserve. When you swoop in by seaplane, a hand-carved sign greets you on the landing platform: 'Welcome to Baa Atoll…Altitude 0m. Population: Friendly.' And yes, that’s a hallmark of a Four Seasons Maldives resort – impeccable five star service from genuinely friendly staff. Every member of staff has a wide smile for you, even if you’re just passing by them on one of the sandy pathways; this goes a long way towards making you instantly feel relaxed and welcome. I know it's all part of the Four Seasons brand but it's something you don't forget. Breakfast with your toes in the sand, anyone? The island itself is breathtakingly beautiful. It’s blessed with an abundance of mature coconut trees, their slender boughs arching skywards, not to mention pink and white hibiscus, red bougainvillea and exotic pandanas. Sandy pathways snake their way around the island past bursts of thick vegetation, attractive dining venues and elegant villas. The wide path from the main arrival jetty is lined by dizzyingly-tall coconut trees, almost like a natural colonnade. It leads to an imposing two-storey reception building with a coconut-thatch roof. The stylish reception area is filled with flowers and furnished with inviting-looking lounge seats, candles and romantic drapes. 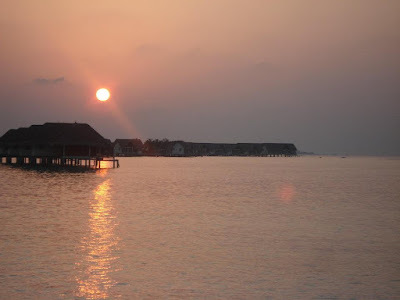 There are several room categories to choose from but generally speaking the beach villas offer slightly more space and the water villas are newer and slightly fresher. 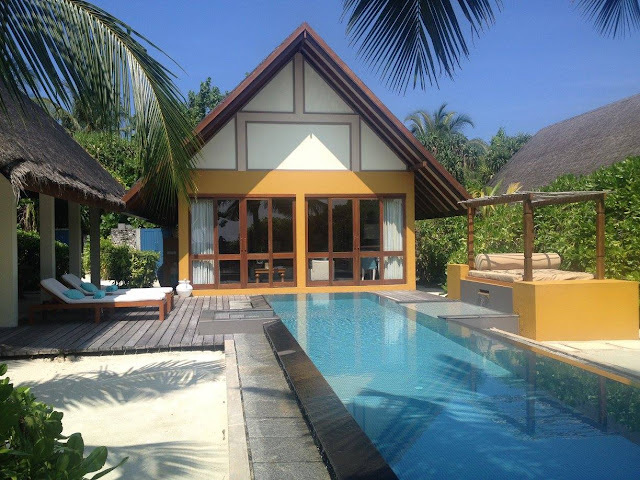 We stayed in an amazing beach villa which came with a large private pool, private garden and a kind of pool house/relaxation area with a hammock. All of the accommodation is elegant and understated; decorated in soft hues and natural materials in harmony with the tropical environment. The four poster beds with sheer drapes are not only romantic but also some of the most comfortable in the Maldives. 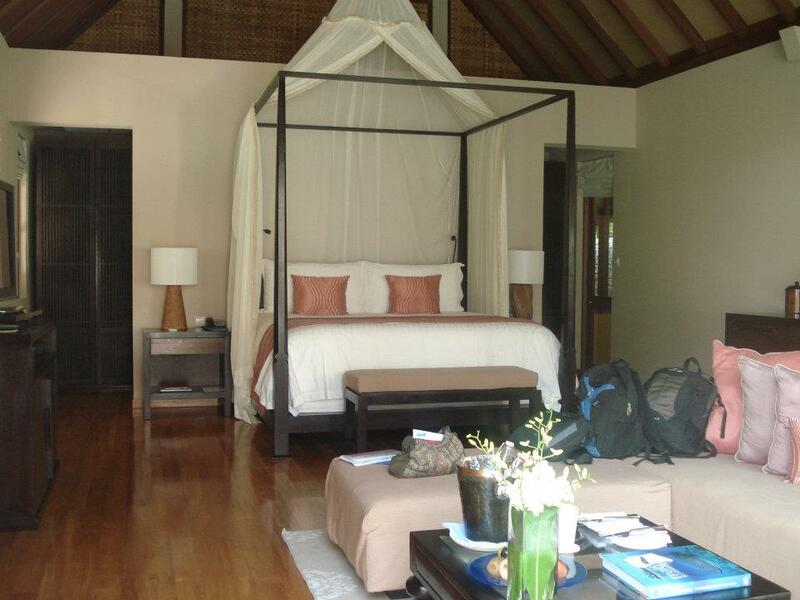 The bathrooms are cavernous and include an outdoor shower screened behind a Maldivian coral stone wall. While the interiors are undeniably gorgeous, the spacious outdoor areas of the beach villas are the absolute icing on the cake. 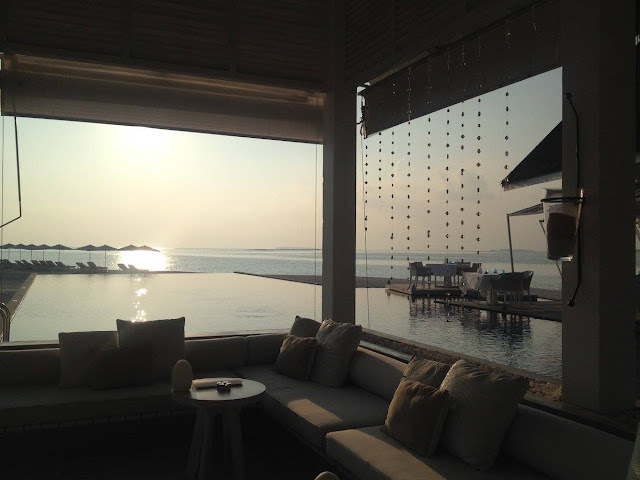 Stepping through the floor-to-ceiling glass door panels to the private beach and garden area, I discovered a beautiful pool complemented by a day bed with a canopy and two sunloungers laid out with fluffy clean towels and pillows. Just steps away from the pool was a raised cabana furnished with a sofa and dining table – the perfect spot for a romantic al fresco dinner. And just beyond the cabana was yet more private beach to enjoy, shrouded by thick vegetation for the utmost in privacy. 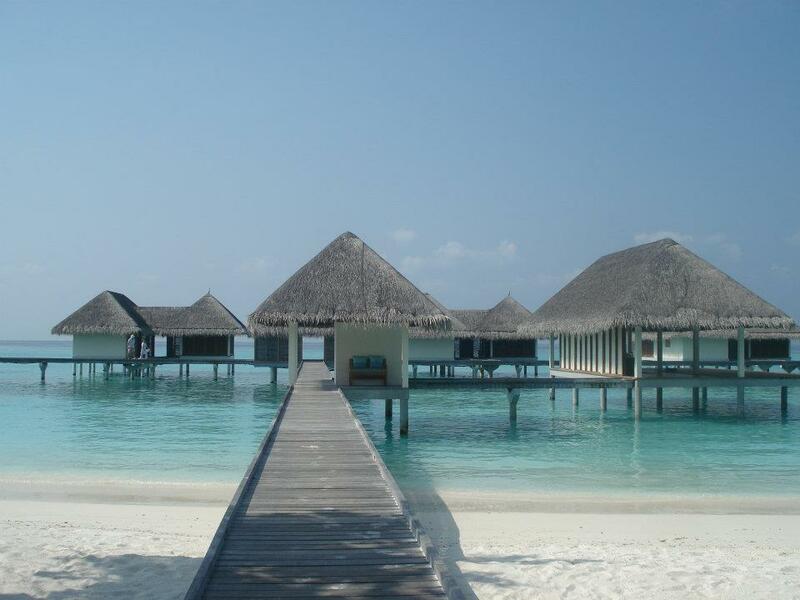 It unfolded to a view of a pristine beach of powdery white sand and a turquoise lagoon. Hardly any islands were to be seen on the horizon; just a vast expanse of glittering ocean, which added to the sense of total seclusion. The water villas are equally attractive and are furnished in a similar style. They have spacious private sundecks and some have pools or hammocks. A nice feature is the winding staircase leading to a semi-open air mezzanine level, where guests can relax on a day bed and drink in the incredible watery vista. The quality of the cuisine at Four Seasons Landaa Giraavaru does not disappoint either. 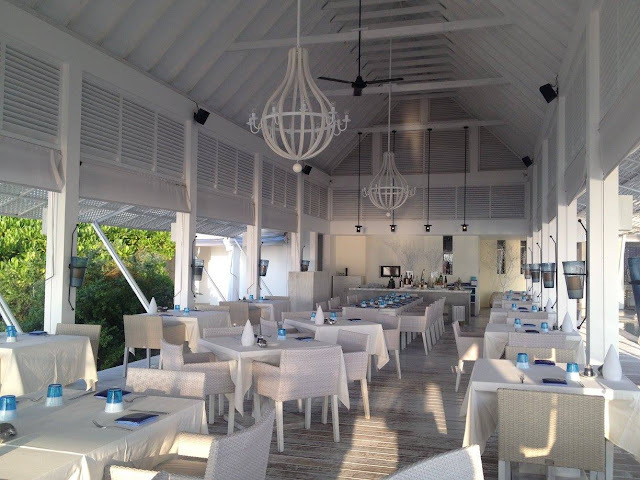 The resort has a variety of dining venues offering exquisite delicacies, each with a distinctive atmosphere. Al Barakat transports guests to Arabia, with a shisha bar decorated with colourful glass lanterns on the ground floor and a breezy rooftop terrace overlooking the lagoon for dining. The authentic cuisine can be enjoyed while you sit on the comfortable lounge seats under the starlight overlooking the water. Another highlight is the Mediterranean-themed restaurant, Blu. By contrast to Al Barakat, the breezy semi-open air pavilion comes into its own on a bright, sunny day as you overlook the brilliant white sandbank. It’s set around a pool and painted in white, with rustic chandeliers, driftwood and painted starfish adding character to the surroundings. There's plenty to do on the island. Well, what I mean by that is as with anywhere in the Maldives, there's plenty to do as long as you like water! Other than cycling around the resort on a free bike with the breeze in your hair and the sun on your back, there’s a fully-equipped five star PADI dive centre. The friendly multi-lingual team can show you some of the amazing dive sites in the area. Or if you somehow end up visiting on your own, you can do as I do when I travel solo and just drop by for a chat. If you enjoy snorkelling, then definitely go to Hanifaru Bay between June and October. The bay is famous the world over for a spectacular natural phenomena which occurs when the weather conditions, tide, moonlight and other conditions are just right. At certain times of the year Hanifaru Bay comes alive with zooplankton which attracts large aggregations of manta rays and even some whale sharks in a filter-feeder feeding frenzy. The rare spectacle of so many mantas and whale sharks together in one place is extremely unique, and visitors are allowed to visit the bay to snorkel alongside them on request, as long as they behave respectfully towards the gentle giants of the ocean. The resort also offers a ‘Manta On-Call’ service, whereby if any staff spot any mantas in the area they will contact you while you’re busy enjoying the resort. The dive centre is complemented by the adjacent Marine Discovery Centre, which is great for guests of all ages. You can see baby turtles or rescued turtles, learn about the resort’s anenomefish (aka ‘Nemo’) and seahorse breeding programmes and generally discover what Four Seasons Resorts Maldives is doing to help with conservation in the area. 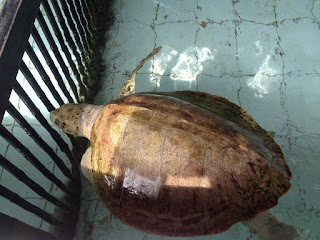 Side-note: Turtles mistake plastic bags for jellyfish and ingest them, then because their bodies can't get rid of it the plastic stays inside them and inhibits them from being able to dive for food so they can starve to death. The amazing team tries to remove as much plastic as they can and nurse them back to health. The watersports centre offers a range of fun activities including wakeboarding, Seabob rides, dolphin-spotting cruises, kayaking and fishing. There is also a range of land-based activities including tennis, beach volleyball, badminton, yoga and jogging. On one occasion I joined a session of zero-gravity yoga, aka 'flying yoga' and ended up hanging upside down in the jungle pavilion, surrounded by fruit bats doing the same thing! But if that all sounds too energetic, the resort also boasts four fantastic swimming pools where you can laze the day away accompanied by a delicious tropical cocktail or chilled glass of wine. There is not one ugly corner of this island! One final point: I'll briefly mention that on the third or fourth occasion I visited I fell sick after a late dinner with the Assistant Manager (nothing to do with the food or the amazing Celeste Crianza he recommended, it was something else I'd rather not share with the world right now) and the way they reacted was incredible. I texted the PR guy early in the morning to explain I unfortunately wouldn't be able to take part in the day's activities they had planed for me; they always drew up a list of things they thought I'd find fun and had arranged scuba diving, a jet pack and an underwater scooter for me to play with that day! He sent the on-site GP straight over to my villa with some antibiotics. Since Four Seasons Maldives at Landaa Giraavaru also has an Ayurvedic Village, the GP was trained in Ayurvedic medicine as well, so he also prescribed me some Ayurvedic tea. It didn't stop there. I was feeling a little better a few hours later, so the doctor accompanied me on my scuba dive too, to ensure I was OK, and also the General Manager dropped by to see how I was feeling. Sometimes when you're far from home and you get sick all you want is your mum to look after you. Well, unfortunately she was some 5,330 miles away but the way everyone treated me at L.G. when I was ill briefly was the closest thing I could feel to having family looking after me, albeit on a luxury island in the middle of the Indian Ocean. Yet another reason why this resort is still in my heart.